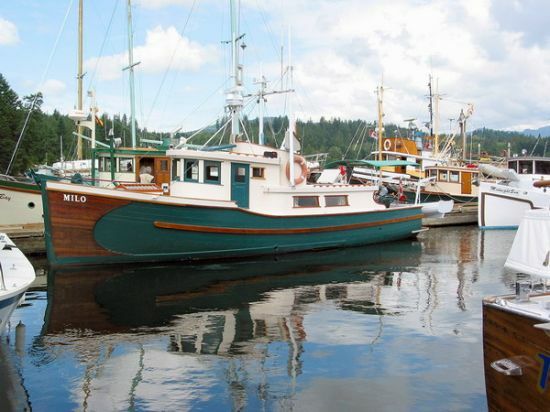 The vessel in Question "Milo" had not only been a participant of the Sunshine Coast Wooden Boat Festival but won the first ever People´s Choice Award there. We knew it had recently been sold to new owners - but we ned the vessel well. They had been taking her Back down the Strait to Gibsons when they switched over to their 2nd fuel tank. As is so painfully common after a calm summer and not a lot of use water had crept into the tank and with the 3´-6´ Chop had churned into their fuel. Their engine stalled and some of the crew became quite seasick. A tugboat waiting out the gale in the Lee of Trail Island (About 2 miles away) steped up and started towing Milo before we arrived on scene and everyone deceided that they should just keep her under tow until we had ll got into the Lee of the island to make it easier for us to take over. It wasn´t that nasty out - but Milo was not riding well in the seas and with some of their crew seasick it didn´t make sense to prolong their suffering. Everything went well and we towed the Milo into the small protected harbour at Selma Park (basically just a single floating Dock behind a breakwater - there isn´t even a ramp so we helped them ashore. The people on Milo were very appreciative and we were pleased with the result. It was dark by this time and I enjoyed the Helm as we transited Back to base. The sea was still only running About 4´-5´ when we weren´t in the Lee of an island - but it was very cloudy so I couldn´t really see anything. I was glad all the crew were experienced as it´s a bit disconcerting for the uninitiated to boot along at 30 knots in a small open Boat in the pitch dark in 4´ seas when you can´t see the waves coming ;) for us - it as a hoot! As side note, this was the first time Kellei and I were able to wear our new Whites SAR dry suits on a call. We got the new suits in the spring and it has been too hot up until now to use them. But WOW what an amazing, comfortable, feeling to have that suit on! It will make working in the winter much nicer. As it was - we were shipping a fair bit of water and it was raining prety hard on the way Back last night - so they were much appreciated.